Here are some snazzy birthday facts about 12th of October 1981 that no one tells you about. Don’t wait a minute longer and jump in using the content links below. Average read time of 10 minutes. Enjoy! What day was my birthday Oct 12, 1981? October 12, 1981 was a Monday and it was the 285th day of the year 1981. It was the 41st Monday of that year. The next time you can reuse your old 1981 calendar will be in 2026. Both calendars will be exactly the same! This is assuming you are not interested in the dates for Easter and other irregular holidays that are based on a lunisolar calendar. There are 176 days left before your next birthday. You will be 38 years old when that day comes. There have been 13,703 days from the day you were born up to today. If you’ve been sleeping 8 hours daily since birth, then you have slept a total of 4,568 days or 12.51 years. You spent 33% of your life sleeping. Since night and day always follow each other, there were precisely 464 full moons after you were born up to this day. How many of them did you see? The next full moon that you can see will be on April 19 at 11:14:00 GMT – Friday. Fun stat: Your first one billion seconds (1,000,000,000) happened sometime on June 20, 2013. If a dog named Peepers - a Keeshond breed, was born on the same date as you then it will be 186 dog years old today. A dog’s first human year is equal to 15 dog years. Dogs age differently depending on breed and size. When you reach the age of 6 Peepers will be 42 dog years old. From that point forward a medium-sized dog like Peepers will age 4.5 dog years for every human year. America‘s first insane asylum opens for 'Persons of Insane and Disordered Minds’in Virginia. First celebration of Columbus Day in the USA held in New York City. World War II: The Axis occupation of Athens comes to an end. Japan’s former Prime Minister Tanaka Kakuei is found guilty of taking a $2 million bribe from Lockheed and is sentenced to four years in jail. The Magellan spacecraft burns up in the atmosphere of Venus. What does my birthday October 12, 1981 mean? 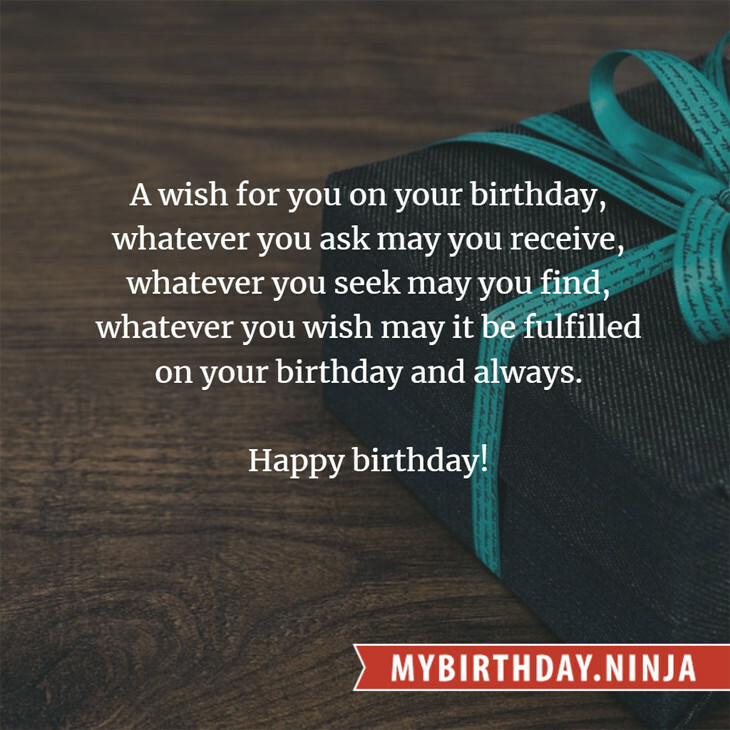 Your birthday numbers 10, 12, and 1981 reveal that your Life Path number is 5. It represents progress, adventure and opportunity. You possess the curiosity of a cat and long to experience all of life. The following celebrities also have the same life path number: Pia Miranda, Joe C., Taylor Mead, Sonja Kristina, Nick Rhodes, Denis Dallan, Lana Turner, Jelena Karleuša, Danny John-Jules, Nil Karaibrahimgil. 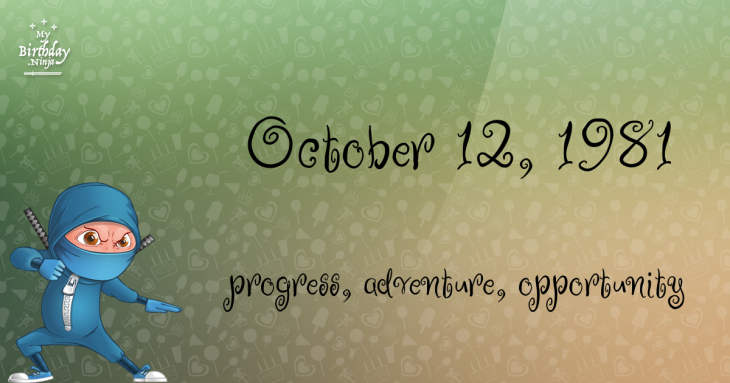 What is the birthday horoscope for Oct 12, 1981? The Western zodiac or sun sign of a person born on October 12 is Libra ♎ (The Scales) – a cardinal sign with Air as Western element. The ruling planet is Venus – the planet of love and beauty. According to the ancient art of Chinese astrology (or Eastern zodiac), Rooster is the mythical animal and Metal is the Eastern element of a person born on October 12, 1981. Fun fact: The birth flower for 12th October 1981 is Cosmos for constancy. How many babies were born on October 12, 1981? Base on the data published by the United Nations Population Division, an estimated 127,030,934 babies were born throughout the world in the year 1981. The estimated number of babies born on 12th October 1981 is 348,030. That’s equivalent to 242 babies every minute. Try to imagine if all of them are crying at the same time. What is the popular baby name on 12 Oct 1981? Here’s a quick list of all the fun birthday facts about October 12, 1981. Celebrities, famous birthdays, historical events, and past life were excluded. Try another birth date of someone you know or try the birthday of these celebrities: April 29, 1924 – Zizi Jeanmaire, French ballerina and actress; December 23, 1968 – Lucy Bell, English-Australian actress; April 5, 1939 – Crispian St. Peters, English singer-songwriter (d. 2010).